Before each flight we sit in the clubhouse and discuss the approaches and the associated plates. With John's help I'm slowly getting better at picking up the devils hidden in the details of each approach plate -- the small print and marginalia that needs to be interpreted, or, more fundamentally, noticed -- and there's a bunch of minor (but very common) devils lurking below this evening's approaches. 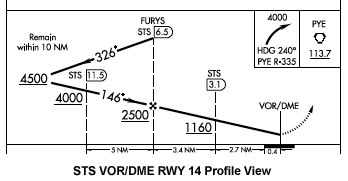 The plate for the VOR RWY 32 approach also has some small print that's essential reading -- firstly, "When local altimeter not received, procedure NA." This is pretty straightforward -- if you can't get the local altimeter setting from ATIS or Center, you can't do the approach -- but I can imagine someone missing this one day without thinking (there isn't a lot of terrain in the direct path of either STS approaches, but there are some nice mountains only a few miles to either side; the published MSA around STS is 5,900'). Secondly, it says that "S-32 Cat D DME minimums visibillty increased to RVR 6000 for inoperative MALSR." OK, we're not a Category D aircraft (sadly), but it's still a good reminder that the approach lighting is an integral part of the approach, and its being out of service will affect certain types of approach significantly.